One of the best activities you can do with your children to encourage language acquisition is reading together. I started reading to my children when they were two or three months old. The first books we read were bright and colorful board books with a single word or short sentence per page. We soon progressed to books of nursery rhymes and books that were illustrated songs. Although my babies didn’t understand the words at first, they enjoyed the bright pictures, the rhythm of the words, rhymes, and songs, and the cuddling with Mommy. Story time became a treasured part of the day for both of us. · 2. After you read a page, ask questions about the story. The simplest questions are factual ones…”Who said…?” “What happened…?” More difficult are “why” questions. · 4. Have your child retell the story after you finish reading it (narration). · 5. Have your child tell you the story by looking at the pictures. Or the two of you alternate pages, making up a story to go with the pictures. · 6. Interrupt your reading occasionally to comment on the story or setting or to explain a concept or define a word. · 8. Rhymes and songs are wonderful for language development–even if you can’t carry a tune! Which speech sounds are the easiest? Babies don’t talk. You don’t have to worry about speech for the first year or two, right? WRONG! No, babies aren’t born with any language skills and it will be about a year before the baby actually says his first word, but the language learning process begins at birth. The foundations in speech and language you give your child from his or her first weeks will affect his development for years to come. Babies are constantly listening, watching and learning to interact with others. At three to six months, they begin to experiment with sounds and back-and-forth interaction with their caretakers in preparation for the real language that will be emerging at around a year. In their first year, well before they say their first real words, babies babble many different sounds as they experiment with their voices. Supposedly, babies actually produce and experiment with ALL of the sounds, including those not in their native languages. As they mature, immersed in their native language, they start limiting themselves to only the sounds that they hear and eventually lose the ability to even hear many sounds in other languages. When I was visiting in Korea, I would try to imitate a word, to be told repeatedly, “No!” And they would say the word again. I thought was repeating the word I was hearing! Apparently not! You are probably aware that Asians often confuse the sounds “l” and “r.” That sound is the same in their languages and they actually cannot hear the difference. This is why, if you want your child to speak fluently and without an accent in a second language, he must be exposed to the second language very young in life. -8 to 9% of children have speech sound disorders. By first grade, 5% have noticeable speech disorders. -Most children with articulation disorders have no other handicaps or causative factors. -More than 3 million Americans stutter. The highest prevalence of stuttering is between the ages of 2 and 6 and fewer than 1% of adults stutter. -About 7.5 million Americans have voice disorders. -Between 6 and 8 million people in the US have language disorders. -Articulation, language and stuttering disorders and autism are 2 to 4 times more likely to occur in boys than in girls. Children start to learn the rules for making plurals fairly young—often in their second year. Irregular plural forms are mastered a little later and it is not uncommon for 4-year-olds to make occasional errors with plurals. If your child seems to have trouble mastering the rules for plurals in his speech, some focused practice can often help him along. The following activities are excerpted from my book Language Lessons, which is packed with games and activities to enhance skills in listening, comprehending, and producing language. what are the most common articulation errors? When a child starts repeating words and sounds, taking forever to get a sentence out, it can be alarming to parents. They may wonder if this issue will go away or will continue to get worse. And what should they do about the problem? Many children go through normal periods of disfluency around ages 2-4. This usually occurs during periods of rapid vocabulary acquisition. Children typically repeat words and syllables, especially when excited or talking rapidly. In some children, this normal developmental disfluency develops into true stuttering, which can be a lifelong struggle. The trick for speech pathologists is to identify which children would benefit from therapy in order to “cure” or minimize the problem early. Almost all stutterers begin stuttering before the age of five and it is very important to begin therapy early to remediate the problem. Do you ever wonder if your child’s speech skills are normal? We don’t expect a three year old to have perfect speech, but we do expect excellent articulation skills from a ten year old. Here are a few questions to help you figure out whether your child is developing articulation skills at a normal pace or whether you should be concerned. These are just general guidelines. If you have concerns, you may want to have your child evaluated by a speech pathologist, who might suggest therapy or assure you that your child is developing normally. 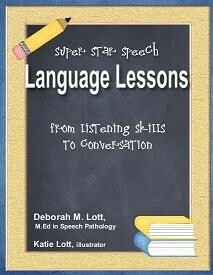 My book, Super Star Speech: Speech Therapy Made Simple also contains a simple articulation test that assesses each sound. Whether your child is in formal speech therapy, or whether you are working with him or her on your own, consistent practice is very important. But don't worry--you don't necessarily need to carve out large blocks of time to work on articulation skills. A few minutes each day will likely provide better results than less frequent, lengthy practice sessions. Here are some suggestions for ways you can incorporate speech practice into your day, a few minutes at a time.